Collin Whelley, a Senior Analyst at the Center for Social Innovation, has been working in the field of homelessness and poverty for more than 10 years. From a street outreach worker to an academic researcher, Collin has been searching for new ways to address issues related to homelessness and poverty. Collin's current interests include program and best practice implementation and evaluation as well as the politics of social justice. On Tuesday January 27th, as the blizzard went on and most were inside keeping warm, I was reflecting on Jeff’s words and decided to take a walk in the snow. This is what I found. 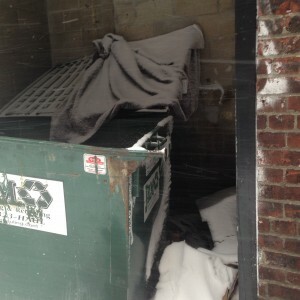 Monday night during winter storm Juno, in the shadow of one of Boston’s wealthiest neighborhoods, someone stayed behind this dumpster. In cities and towns around the country, individuals and families seeking shelter and safety out of sight, down alleyways, in abandoned buildings and tunnels, under bridges, on crates in drainage pipes, on our sidewalks and at our very feet have become commonplace. We call this “homelessness,” yet this term is empty because it does not transpose onto our hearts the reality of suffering and resilience that take place. Empathy requires context.